What Can We Learn From Powerful Political Men Behaving Badly? Here we go again ... It seems that nary an election season passes without some high-powered political leader getting caught with his pants down -- literally. Former Congressman Anthony Weiner and San Diego Mayor Bob Filner are the latest in a long line of political philanderers, gropers, harassers, cheaters, and liars. You can add their names to those of Clinton, Schwarzenegger, Edwards, Sanford, Ensign, Vitter, Spitzer, Kilpatrick, McGreevey, LBJ, Kennedy, Eisenhower, Roosevelt, and many others over the years. What are we to make of these powerful men behaving badly? Are there lessons we can learn from them? I would suggest the answer is "yes." As British crime novelist Catherine Aird pointed out, "If you can't be a good example, you'll just have to serve as a horrible warning." First, the human mind's capacity for denial is powerful. Most, if not all these men undoubtedly rationalized their behavior in order to continue it. They were con artists who did their best to con citizens into believing their public image ... and most of all, they conned themselves. Never underestimate the power of denial -- in yourself or anyone else. Second, power, prestige, fame, and money are intoxicating. Mixed together, they are a powerful cocktail capable of lowering moral inhibitions and freeing men from the constraints of conscience. These political philanderers are not sober and rational -- they are literally "Governing Under the Influence" (GUI). They are drunk on power, fame, money, and ego. Third, as Henry Kissinger pointed out, "power is the ultimate aphrodisiac." In some instances, a powerful politician is the target of a woman intent on seducing him. There have always been women drawn to political power like moths to a flame. Remember, it was Monica Lewinsky who told her friends that she was "going to Washington to get my presidential kneepads." Rielle Hunter sought out John Edwards to tell him, "You're hot." Beautiful women often throw themselves at powerful men and it is not easy for men to resist such opportunities. That's not to say that political philanderers are the innocent victims of conniving women -- they're not. In most cases, the politician was the initiator, the seducer, the sexual aggressor. But remember, "it takes two to tango" and unless the situation was blatant sexual harassment or assault, the vast majority of political philanders had willing -- even eager -- female partners. Fourth, who among us has not behaved badly? Or, who among us would not behave badly, given the right opportunity? According to the "Journal of Marital and Family Therapy," 22 percent of married men admit to marital infidelity; 57 percent acknowledge cheating in any relationship they've had; and a whopping 74 percent say they would have an affair if they knew they would never get caught. It's easy for us to act as judge, jury, and executioner when it comes to our public figures -- but are we really are as pure and righteous as we'd like to think we are? Perhaps our time and energy would be better spent strengthening our own marriages, rather than scolding others about theirs. And finally, we can practice compassion for the ne'er-do-wells. Bad behavior is often driven by deep-seated insecurity, self-loathing, fear, and/or a profound longing to be loved. All the world's great spiritual traditions preach the virtue of compassion. That doesn't mean that we shouldn't hold men accountable for their bad behavior -- we definitely should, and we definitely do. But we should also offer them the hope of forgiveness and redemption. 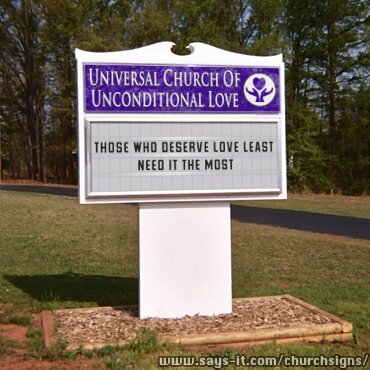 I am reminded of a North Carolina church marquee I saw many years ago that seems appropriate as we reflect on our political leaders behaving badly: "Those who deserve love least, need it the most." BJ Gallagher is a sociologist and the author of over two dozen books, including "Everything I Need to Know I Learned from Other Women" (Conari Press).